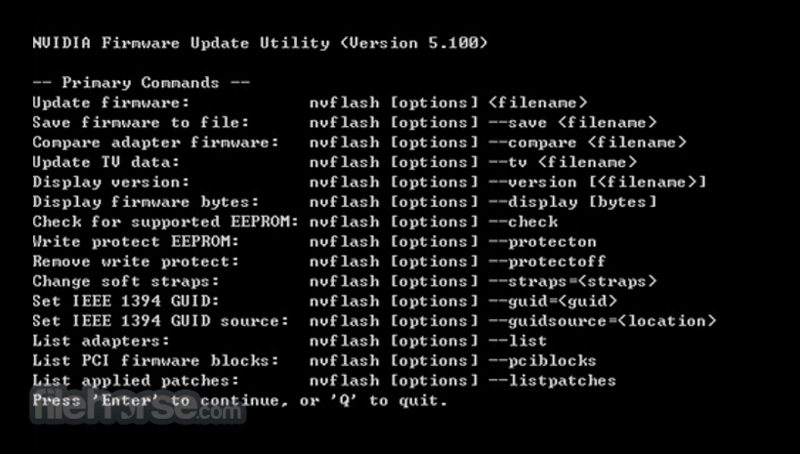 nVFlash is used to update the firmware stored in the EEPROM of a NVIDIA display adapter. It can also be used to perform other tasks on the adapter such as saving a copy of the current firmware image to a file, displaying the version of the firmware image, or determining the EEPROM part present on a display adapter. This archive contains a 32-bit and 64-bit version of the NVIDIA BIOS flashing utility. nVFlash is a command line utility that can be run stand alone from the command prompt, run from batch files, or spawned from other programs. Note: Requires Video-based GeForce 256 and a new image processor.